The growth and interest in Content Marketing is now an undeniable force for businesses and marketing. Content marketing is an imperative for brands who want to reach their buyers in an information-saturated world. We are no longer asking whether content marketing is the future. We are now looking to understand the future of content marketing. Along the way, I’ve been collecting facts, stats and insights on the future of content marketing that support the need for change. Change away from traditional push-based messages that our audience is increasingly tuning out. And so thanks to folks like the Content Marketing Institute / MarketingProfs, the Corporate Executive Board (CEB), Tom Pick and many others, here are 33 stats on the future of content marketing. Hi Michael, thanks for the shout out. Glad my 30 Content Marketing Stats post was useful in feeding the beast. Outstanding presentation! Thanks Tom. I wanted to add “tweet this” but just didn’t get to it. Thanks again for the extra sources! Thanks for your efforts to inform, appreciated. Slide 35 “The 3 biggest complaints B2B buyers have about vendor content are too many requirements for downloading; blatantly promotional, self-serving content; and non-substantive, uninformed content”, really struck a cord. Too many prospective client contact points have a ‘gate-keeper’ effect where too many details are requested. I suggest this clearly gives the message from the brand to prospective clients ‘I’m not going to share with you unless you give me something before-hand’. Personally, even if I think the content might prove to be exceptionally informative I’ll simply close the tab window or click the back button. Those drawing insights from visitor traffic and analytics data must surely be able to see the difference in drop-off rate at such points. If some suspect or are not sure results of an A/B split test might help them discern between the drawback of having a visitor data request before sharing content and content that does not require a visitor data request before the content is viewed. One can only hope as competition for relevant traffic increases such gate-keeper touch point tactics will become a thing of the past. Thanks Jordanna, as brands we really have to earn the trust of our prospects before we can ask them for anything in return. I think this is becoming more clear with each passing day! Absolutely agree about trust. When buying a car you visit a number of car dealerships, have a look around and kick the tires (so to speak) and have a chat with the car dealership person. You end-up choosing the one you trust the most to fill your need. A wise car dealership person knows this too. I’m considering compiling a list of touch-points I come across that require anything more of me other than my email address when they have content available to share. Essentially brands and bloggers alike who deem they don’t have to earn my trust before they ask me for anything. Thanks Denise. I think you’re right. Or better yet: it’s a great time to be a great writer. Or at least one who knows how to write for the social / mobile web. Those stats are mind blowing. It shows not only the opportunity that still exists but also the harsh truth for those still not worried about getting into the content marketing space. Thanks Maciej, I was hoping that would be the end result of sharing this. That it would support those already in it and help move those who are still resisting the imperative to create better content. Thanks Meg, you guys sure know how to curate great facts! 😉 Appreciate the great additions. Thanks for the ContentPlus mention – a great roundup of stats! Thanks for including Content Plus in your post Michael, there’s some great stats up there! Thanks Natalie, this is great! Michael–I just realized that you included me in your article. Thanks for compiling and sharing this Michael. 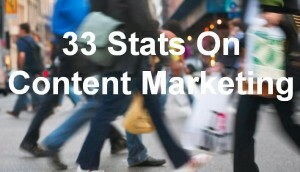 Really informative content marketing stats that every marketer needs to know.